For many women, their hair gives them confidence, and I’m no different. Good hair days make me feel great (don’t get me started on the power of a good blow dry). But to get that full-bodied, swish-worthy result you need healthy hair in the first place, which isn’t the case for so many. Thinning, lifeless hair is a concern for more people than you know. I’m not referring to thinning caused by genetics or a medical condition; I’m talking about reactional thinning, which can affect us all. Yes, even you! It’s common for hair to become thin after pregnancy. But although it’s normal, it can have a big effect on a new mum’s self-esteem, which is why I wanted to highlight that this quinine spray will help. Not only does the spray slow down the thinning process in just one month but it helps stimulate growth, which is excellent if your hairs been coming out in clumps. Bright blonde hair and Rapunzel-like extensions may look great at first, but after a while, they’ll have a damaging effect on your hair. If you’re feeling guilty reading this, then I’d build bridges with me (and your hair) by adding this fortifying treatment to your regime stat. The keratin innovation in the formula will reinforce the hair shaft so that you can make your hair strong again. A fast-paced, non-stop lifestyle can take its toll on the body. And one of the ways our bodies can show signs of stress is by hair becoming thin and weak. When this happens, it can often cause people to panic, which creates a vicious cycle. My advice? Breathe, take some time out and give this a go. This Quinine spray is made especially for this and will help restore the nutrients your hair is losing at this busy time in your life. Hard water may not be harmful to your health, but it’s definitely not good for your hair. This is because hard water contains a high concentration of minerals and oxidisers, which in short cause play havoc with your tresses; think dryness, breakage and thinning. A quick Google will help you pin-down whether you live in an area with hard water, and if you are this will be music your ears hair. It’s a strange thought, but we shed hair just like dogs do. Typically, for humans, this happens at two points in the year; firstly around July and secondly in November. Interestingly, our hair is at its thickest in the summer to protect us from the sun (who else would have put their money on winter for warmth?). 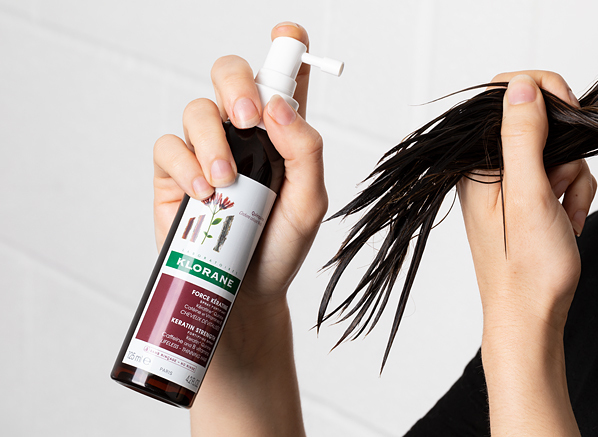 This process is entirely normal, and hair will return to its natural thickness, but if you’d like a helping hand (or don’t fancy waiting it out), this spray is the perfect go-to. 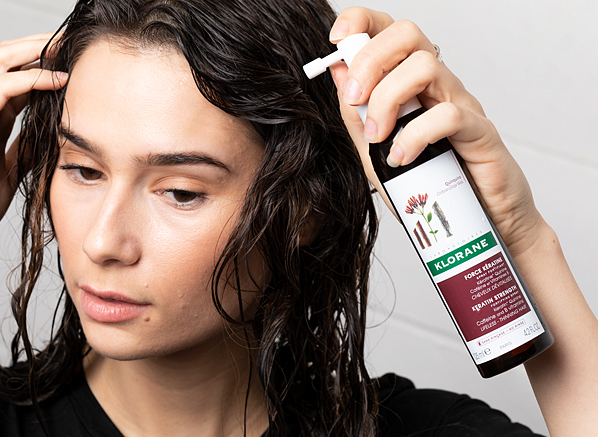 Want to learn even more about the Klorane Quinine Keratin Fortifying Spray? We’re currently putting it to the test with bloggers and the before/after results will be revealed here on the Escentual blog, May 10th. I have used Klorane products before, but not Quinine Conditioner until now. Very happy, well done Klorane!Excellent as usual! This entry was posted on Thursday, March 14th, 2019 at 9:53 am and is filed under French Pharmacy, Haircare, Hints & Tips, New products. You can follow any responses to this entry through the RSS 2.0 feed. You can skip to the end and leave a response. Pinging is currently not allowed.